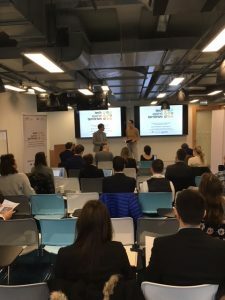 Tech Against Terrorism held its eighth and final workshop of the year in Brussels on 5th December. 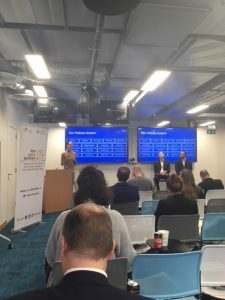 The event was hosted at Facebook’s offices and held on the side-lines of the EU Internet Forum. The event brought together a range of stakeholders, from small tech startups to NGOs and members of the GIFCT (namely Facebook, and Twitter). The key issues raised during the workshop emphasised the importance of knowledge-sharing between government and private sector, the need to continue developing cross-sector co-ordination, and the importance of balancing the line between content regulation while still upholding human rights such as freedom of expression. The first session was hosted by our project director Adam Hadley and involved a presentation on the background and aims of the project. In the next session on “The State of Play: Expert Researchers and Government Threat Assessments”, three speakers with a wealth of experience in different sectors (The Egmont Institute, Europol, with a Senior Public Prosecutor from The Netherlands), offered compelling insights into their threat assessments. The researcher from Egmont delivered a local threat assessment on Brussels, and spoke of the challenges in programmes on preventing radicalisation. He emphasised how the process of radicalisation can be either religious or behavioural, either ideological or pushed by one driven tov violence, and both trends are observable in Belgium. He referenced ‘radicalising hubs’, where the process remains extremely localised in schools or street corners, and that these root causes seen are yet to be sufficiently/effectively addressed. Finally, the researcher warned of the challenges of mutual radicalisation, where a rise of one form can trigger another, as seen with the growth of far-right extremism in Germany. The Senior Public Prosecutor had a number of important recommendations for those in the room, and spoke of the legal difficulties in investigating and prosecuting those who exploit online platforms. In The Hague, there is a tricky legal distinction in that the incitement to terrorism or violence is illegal, but the production of propaganda is not. When some of the more dangerous online content is in fact the non-violent videos and images, it can make prosecuting those responsible for its dissemination difficult. A further legal difficulty lies in defining a radical, or one undergoing a process of radicalisation. As the prosecutor emphasised, it is not illegal to ‘be a radical’, especially not in societies that are founded upon freedom of expression. He warned that we are entering into a new legal era, and collaboration from all parties will be key for stability. The prosecutor praised the efforts of large tech companies in assisting with some of their investigations and emphasised “Try to communicate, be brave, and don’t be afraid of prosecution or the police… let’s work together and take into account recommendations”. Finally, a representative from Interpol presented their investigative processes and global networks, emphasising their reliance on the assistance of information-sharing by those in the GIFCT. A similar point was emphasised by the prosecutor who requested that all tech companies “try to be as transparent as you can, and be as open as possible”. It is clear that collaboration is key, and that public and private sectors should continue to information-share and work together. In the Q&A, a question was asked on the effectiveness of counter-narratives, with the representative from Facebook positing “what does impact look like?”. Facebook has provided over thirty workshops, offering market training on how to send a message and/or narrative effectively to an audience. It is a difficult area to determine progress and success, and as a project, we are keen to continue encouraging debate around counter narratives. During the “Company Responses” panel, the representative from Twitter emphasised the strong commitment to freedom of expression and transparency, stating how “we’ve tried to highlight these numbers in our report, and they will give you more access into the actions we are taking”. Further, Twitter are keen to further examine the understanding of their capability, and to continue cooperation with the wider civil society. A representative from the Centre of Democracy and Technology also spoke during this panel, and emphasised the importance of upholding the rule of law, and having actions guided by said law that is both transparent and foreseeable. While a platform has the right to decide what content it wants to host and what it doesn’t, there should still be parameters of judicial oversight to work within. Indeed, the representative from CDT warned of the risk of automated content analysis tools, arguing that they were not yet accurate enough, and risked undermining important freedoms. With the morning panels concluded, following lunch, Adam Hadley conducted a live presentation of our Knowledge-Sharing Platform (launched at the United Nations last Wednesday), highlighting the practical information and tools available. We want to thank Facebook for hosting us, and to all our participants for their recommendations and insights.